Nephilim are known to be the offspring of fallen angels and ‘the daughters of men’. They are hybrid creatures: a combination of the genes of humans and that of supernatural beings. Nephilim however, are known to have had some unhuman characteristics and features. Most of them were giants, some had 24 fingers and toes in all (6 on each hand and feet), and others had 2 rows of teeth in their mouths. So Goliath was a Nephilim: a descendant of the fallen angels. They were these grotesque and enormous creatures that existed many centuries ago. It does sound like a myth, but by evidence a fact can be established and that’s why I am writing this. The bible makes mention of Nephilim in the Old Testament and also other Ancient books that are considered credible and true like the book of Enoch speak about their existence. In those days, there was a massive invasion of the earth by the Nephilim. This move, obviously orchestrated by Satan, is believed to have been his way of trying to corrupt the genome of the promised Messiah. Look at it this way; he knew God was going to send His son down through a virgin’s womb to save mankind from sin and damnation. Hence, he orchestrated this move in order to corrupt the genes of the entire human race, so that the savior would be born not fully God and fully man, but he would have a bit of the genes of fallen angels in him- thereby making his blood not qualified to atone for the sins of humanity. This necessitated the flood in Noah’s time. That was God’s solution to the whole problem: he had to wipe out all who had their genes corrupted by that of the Nephilim. In Genesis 6:4 it says, ‘The Nephilim were on the earth in those days, AND ALSO AFTERWARD, when the ‘sons of God’ (Angels) came into the daughters of man and they bore children to them. These were the MIGHTY MEN who were of old, the men of renown. Verse5. The Lord saw that the wickedness of man was great on the earth…’. This is exactly the point I raised earlier. The Nephilim had filled the earth with so much evil and sin that it grieved God and he decided to save humanity and the bloodline of the savior hence the story of Noah’s ark. It is common knowledge that in those many years that the ark was under construction, Noah extended a hand of grace to the people. He told them of a pending disaster, yet they made fun of him and didn’t pay heed to his message. That is how gracious God is, for though he sought to preserve the bloodline of the savior, he still loved the evil and pervert generation so much that he offered them a second chance. In the verse above, you will realize that it says there were Nephilim in those days ‘…AND ALSO AFTERWARD’. This implies that after Noah’s ark, there was another eruption of Nephilim. This makes complete sense, when you think about the fact that the story of David killing Goliath happened many years after the flood. There was another eruption of Nephilim and those were dealt with accordingly by the Israelites. Remember when the spies Moses sent into Canaan came back saying that they were like grasshoppers in the sight of the indigenes of the land? Well there you have it; the Canaanites were known to be a Nephilim tribe, definitely made up of giants. In 2Samuel 21:15-22, we see how David and his men killed four of such creatures. This time God did not use a flood to destroy them, just as he promised Noah, but He used his own people. All of these things are facts in the bible or facts of the bible; but are they true? Did Nephilim really exist? The huge skull you see there, next to the human skull, is known to be the skull of one of these creatures. I know naysayers might just jump to the conclusion that it is a human skull. Because we all know people who have relatively big heads: therefore the hefty skull in there could belong to someone whose head was a burden for his neck. The human skull is known to be made up of 4 plates (bones); one at the front, another at the back and two in the middle. The two in the middle are known as the Parietal plates or bones. They form the area of your head from your ear to the top of your head on both sides. The issue is this, the Nephilim skulls do not have two parietal plates, they have just one! Meaning, the structural make-up of their skulls are not uniform with that of normal human beings. The reason why I am stressing this point is, if this is true (which I believe it is), then it means there was a certain generation of ‘human beings’ with distinct characteristics that the Darwinian Theory doesn’t make provision for. How do we explain the origin of such creatures? Will we say they also had a common ancestry with monkeys, ‘as humans do’? Clearly they were not humans or fully human. Some of the bones that were dug up were measured to be the skeletons of 9-15 footers. Creatures of that height are known to be giants. And the evidence is scattered all over the place. 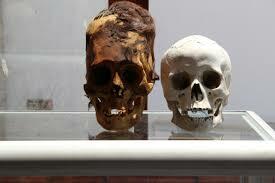 In Paracas Peru, there was a discovery of hundreds of such skulls. There were Nephilim; there were Nephilim on this very earth. And if they existed, then it means there was a creation of a demonic hybrid by fallen angels and the daughters of men. Also, if this is true, it goes a long way to establish the existence of the spiritual realm, angels and most importantly the existence of God. Those who adhere to a Darwinian world view may debunk this fact, but the evidence is so glaring. There once were creatures on this earth that were mighty in stature and intellect and from the structure of their cranium, they couldn’t have been humans. God’s not dead; and the evidence is all around us.